Rookwood Office: Monday - Friday 9 am - 5 pm. Visit BankWithPark.com for all offices and hours. For more than a century, Park National Bank has helped local families, businesses and communities achieve financial success with more confidence and ease. Our heritage is firmly rooted in values of service, integrity and local community commitment. Our customers enjoy access to full-service banking at our local offices in Rookwood, Anderson, West Chester, and Clermont County. In addition, Park offers all the features and benefits associated with electronic and mobile banking. We are the local community bank of choice with the technology and resources of a large bank. Our clients enjoy the best of both worlds, because the real difference between Park National Bank and other banks occurs when our resources are coupled with our outstanding staff of locally based, professional bankers. Delivering extraordinary service is what we do, what makes us who we are, and what makes us the right choice for so many of our neighbors. If you are not already banking with Park National Bank, this is a wonderful time to give us a try. We welcome the opportunity to serve even more local residents and businesses. Making a change is much easier than you may think, and we are here to help! Park National Bank offers custom Commercial Loan solutions for your business! Meet our team of lending professionals. Planning for your future? Our wealth management experts are ready to help! We're growing! Check out our new office in the Rookwood Exchange. Stay connected! Stay in touch with community events and get helpful news and information on facebook! Are you linked in? We are! Follow us on LinkedIn. 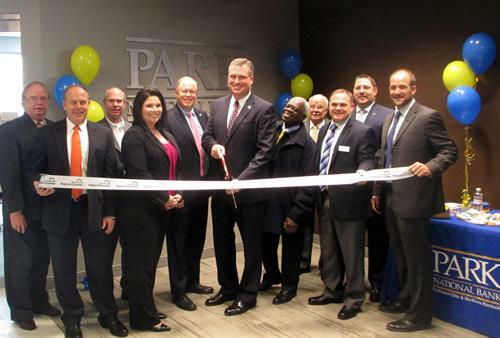 Park National Bank's Rookwood Office is located on the fifth floor of the Rookwood Exchange, 3825 Edwards Road, Cincinnati OH 45209. Easily accessible from I-71 and less than 10 minutes from downtown.